The professional practice requires to keep up to date. You have to “think outside the box”, without constraining into one thought pattern or routine, especially when there are situations that require reflection and need to be addressed with a flexible mind. The registrar of the permanent collection of a museum should be especially flexible. Personally, I learned to be flexible at work in a situation referred to the establishment of categories of works of art from the collection in which I was registrar. There are no pre-established categories, as they are set to be found in the collection that will be recorded and cataloged. The coding categories are complementary to each item. I started as Assistant Registrar in 1986, my boss was the Chief Registrar who studied in the USA. She was organized and a little shrewish. Her mind was not very flexible. This Chief Registrar wisely established the categories or divisions according to the materials and techniques of art works that were in the permanent collection of modern and contemporary art. Such categories contemplated PAINTings, SCULPTures, GRAPHics, PHOTOgraphs and CERamics. In 1988 she quit her job and I was appointed Chief Registrar. Let me comment on at least two of those experiences of flexible mindset and criteria. One of the first things I did was rethinking these categories. 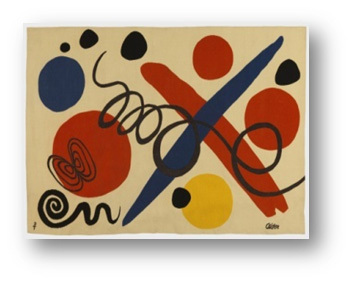 The collection had about five tapestries made by Alexander Calder (see photo), which were within the category of paints. 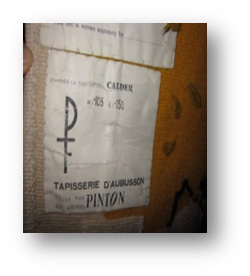 And if I had opened a new category of TEXtiles and named it this way, this would be too generic, it would cover clothing, tablecloths, curtains, handkerchiefs, etc. Second flexibility: the “graphic”, the “figure”, is not a category, it is a representation of figures or signs. I opened a category I called PRINTs (ESTampas, in Spanish) with sub-categories. The term “graphics” is very general and does not refer to techniques or materials to make such creations. The term “prints” encompasses prints procedures and techniques of etching, aquatint, lithography, serigraphy, etc. Those were the sub-categories that I set. These techniques have in common the preparation of a sheet or plate or sieve in which a drawing is performed, marking or cross-hatching, with which contact will then be snapped onto a paper support on which will be printed, stamped- that figure or image of that path or engraving. Moreover, these creations are made for aesthetic purposes. Imagine the case of a collection of contemporary art … to contemporary works such as video art, conceptual art, the ephemeral, or site-specific … The techniques and materials of this art often escape the most classic categories.